Gospel artist, Mr Seed is among the artists who recently exited Bahati´s EMB record label. ´Upo´ is Mr Seed´s recent release featuring Solomon Mkubwa after dumping the record label. The collabo is definitely not a miss after supportive back up from fans. Q&A The Upo hitmaker, popped up a question to his fans in a Q&A session online: A fan promptly responded: But is he ready to reconcile with fellow ´Kumbe Kumbe´ hitmaker? And what would he change in Bahati, given a chance? In the past, Mr Seed revealed that the reason behind his EMB exit was because Bahati mistreated his wife, even disrespecting her. But after the bitter fallout, would he prospectively return back to where he once called ´home´? There we have it! Mr Seed has nothing up against Bahati, he has left the past behind and is focused on the present and future. Unfortunately, returning to EMB record label has proven futile. We wish the two gospel artists positive growth in their music careers and personal lives. 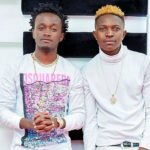 The post Gospel artists, Mr Seed and Bahati still not in talking terms appeared first on Ghafla! Kenya.